Serves one. Why is it that I hardly ever see a recipe that “serves one”? I only really started cooking (and loving it) when I lived on my own, and more often than not, I was cooking to serve one. Aside from learning how to cook, I was also learning to reduce recipes to the smallest serving. I didn’t want to be eating the same thing for weeks (I discovered the hard way…with two weeks of beef kaldereta) so I trained myself to shop, market, prepare, and cook for one. I got really good at it. I never went to culinary school; I wasn’t learning to cook as a profession. I didn’t learn to cook growing up to feed a large family. I learned to cook because I was far away from home and I was hungry. My whole cooking experience, my love for food and everything about it, no matter where it is now, or where it will go in the future, started with just the one: One ravenous me. And I loved it…I reveled in it. Cooking for myself excited me…eating what I cooked excited me. I looked forward to dinner. I ate by candle light. It was a gastronomic love affair with myself. I cannot recommend this experience enough. This is why, no matter who I cook for now, or will cook for in the future, there will always be times when my hands will itch to “serve one” again, when I will want to cook something just for me. Culinary Me Time. This is also the perfect opportunity to make dishes that I have been wanting to try, but are not really C’s cup of tea. This pasta is one such dish. – In a skillet, heat the butter until melted. – Add the sage to the butter and let this fry until the sage is crispy and butter is browned. – Stir in lemon juice, pasta, salt and pepper. Toss until combined and pasta is coated with the brown butter mixture. 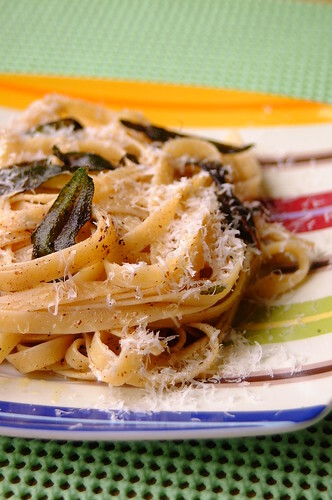 – Top with freshly grated parmesan to serve. This is my entry for Weekend Herb Blogging, a fantastic event created by Kalyn of Kalyn’s Kitchen. This round is hosted by Ellie of Kitchen Wench. You can learn more about sage in the link above, or here. I have *just* scraped down my last few spoons of this pasta! Thank you so much, it was delicious, and the lemon cut the richness of the sage butter perfectly.